Make it easy on yourself and save time from wearing a jacket instead of having to get in and out a full beekeeping suit. 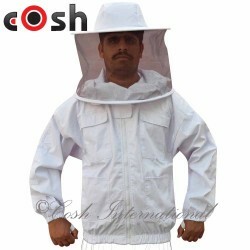 heavy-duty beekeeping jacket offers a balance in protection from stings and expedite and facilitate your trip to the hive. Made from a 100% cotton blend our heavy-duty bee jackets are exceptionally comfortable and easy to throw on for a quick check on the bees. Double Velcro enclosures provide protection from pesky bees trying to crawl inside your jacket. Select bee jackets have a zipper-front, easy-to-zip detachable mesh veil, and the elastic bands around the wrist and waist permitting maximizing protection. Added convenient attribute are elastic thumb straps that attached to the wrists of the jacket which keep the sleeves from slinking up under your gloves or your hands. Most beekeeping jackets may lack in the number of pockets offered, but fence veil bee jackets offer more than enough pockets for most of your tools you may need handy. design features convenient chest pockets and waist pockets for working with your bees hands-free. Details:Made Of 100% Heavy Cotton With Fence Style.. Details:Made Of 100% Heavy Cotton With Round Style.. Details:Made Of 100% Heavy Cotton With Square Styl.. Details:Made Of VENTILATED MESH 3 LAYER With 100% .. Details:SEMI VENTILATED BEEKEEPING JACKET W/ COTTO.. Details:SEMI VENTILATED BEEKEEPING JACKET W/ MESH ..